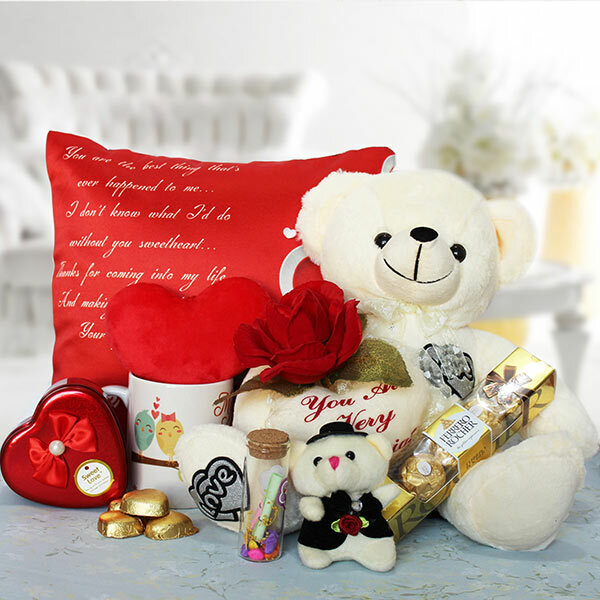 If BIG are your thoughts of surprising your special one then here’s an incredibly BIG Gift hamper that is made full of little hearty, romantic and delightful gifts like chocolates, printed coffee mug, cushion, an artificial red rose, a message bottle, a cute teddy bear, heart shape chocolate box and big cuddly teddy bear. No wonder, gifting this romantic and big gift hamper will be the best way of making the special one feel loved and jump of the floor in happiness. Although, the quality of product was very good but I was disappointed with their delivery service as it didn’t reached on right time. 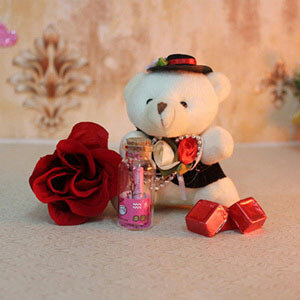 My sister loved the Teddy extremely but she was disspointed because the message bottle was not there. But my order was delivered on time. The product is affordable and good!! I am extremely happy how you people are giving service with dedication.